We have answers to the question, "What drive should I order for my 'late 2012' iMac 27-inch?" Since the 27-inch uses 3.5-inch HDDs, the drive choices and drive performance will be different from the 21.5-inch iMac which uses 2.5-inch HDDs. With the help of remote mad scientists, we were able to get test results on four of the five permutations available to 27-inch iMac buyers. The $250 for the 1TB Fusion Drive is much easier to swallow. And for most users, it will provide plenty of speed -- especially in comparison to the HDD options. In defense of the HDDs we tested, the Seagate Barracuda 7200.14 is the fastest 7200 rpm drive we have tested to date. The only HDD faster is the newest model of WDC Velociraptor 10,000 rpm 1TB drive -- which we happen to have running in our 6-core Mac Pro. NOTICE ONE DRIVE IS MISSING? Remember when we wrote, "four of the five"? The 5th drive CTO option for the 2012 iMac 27-inch: the 3TB Fusion Drive (most likely a 128G SSD SM128E fused to a 3TB Seagate ST3000DM001). We simply did not have access to one or to any "remote mad scientist" that had one and was willing to test it. But you can infer the performance will be the same as the 1TB Fusion shown in the graphs -- as long as the SSD is in play. Once you overflow the SSD and are using the HDD, the performance will be the same as the 3TB factory HDD shown in the graphs. Choose your drive carefully. You can't just pop in an upgrade if you are dissatisfied with your choice. Upgrading the drive requires disassembling the iMac. The first step is a bit icky and risky. You must use a heat gun to melt the adhesive holding the display assembly in place and use a guitar pick to pry the display away from the rear case containing all the components. Not for the faint of heart or someone with five thumbs on each hand. For more on this, see ifixit's disassembly instructions for the 21.5-inch 'late 2012' iMac. The initial part of the procedure is the same for the 27-inch 'late 2012' iMac. During our benchmarking of the 27-inch iMac, we used the newest LaCie Little Big Disk Thunderbolt (with dual 256G SSDs in RAID 0 set). 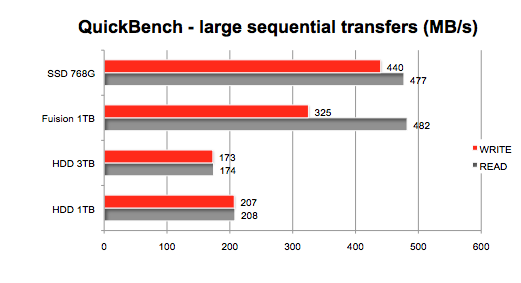 At 700+MB/s READ and 500+MB/s WRITE it's faster than the internal Fusion Drive. In other words, you don't have to crack open your iMac to go faster -- unless you have your heart set on having an uncluttered desk. Otherwise, there are several excellent Thunderbolt enclosures you can buy which provide extra storage speed and space for your new iMac. Don't forget you have USB 3.0 ports now. We will be testing and reporting on two new, fast USB 3.0 enclosures. 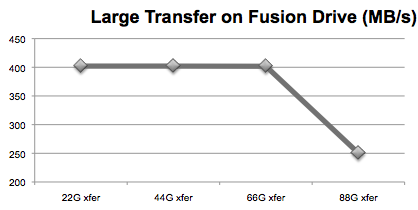 Though the Fusion Drive is impressive, just be aware that it has its limits. 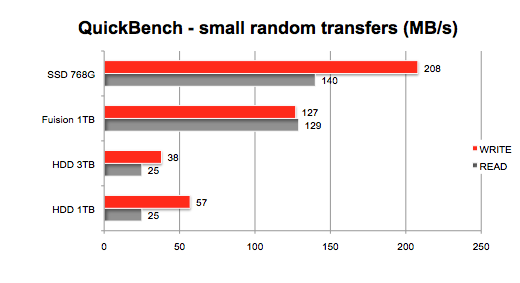 In a test we conducted on various Fusion and cached storage products, we found that the speed dropped dramatically if the transfer size exceeded the unused space on the flash module "fused" to the hard disk drive. In the case of the 1TB Fusion Drive, the drop in speed was triggered when we attempted to transfer 88GB of HD video. That is an extreme test and hopefully won't affect the average user. we have several other test pages posted for the 'late 2012' iMac. See our index page for the full list of recent tests listed in reverse chronological order -- latest first. Other World Computing has various Thunderbolt storage products from various manufacturers. Other World Computing has various USB 3.0 storage product from various manufacturers. Amazon has the Apricorn SATA-to-USB3 'bare' bus powered device for $23 (not counting HDD or SSD attached). Other World Computing has an upgrade kit for the 21.5-inch iMac. It requires disassembly but they provide the tools and the installation video. They also offer memory upgrade kits for the 27-inch iMac.